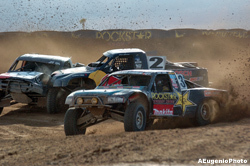 MARCH 9, 2010 – La Mirada, Calif. – Rockstar Energy/Makita Team LeDuc Racing launched a new season of short course off road racing at the Lucas Oil Off Road Racing Series opener in Las Vegas last weekend. Makita joins Rockstar Energy as a 2010 sponsor of Team LeDuc Racing, marking their third season of partnership. The father-and-sons race team, consisting of Curt LeDuc and his sons Kyle and Todd, is a fan favorite on off-road race tracks across the US. Rockstar Makita LeDuc Racing ended the 2009 season with a strong finish in Las Vegas, and the team is looking forward to carrying the winning momentum into 2010. Rockstar Energy/Makita Team LeDuc Racing ended the 2009 season with a strong performance in Las Vegas, and last weekend they picked up where they left off at the 2010 Lucas Oil Off Road Racing Series (LOORS) opener in Las Vegas. In the Unlimited 4 truck final on Saturday, Curt and Kyle LeDuc went to work against the rest of the field in their 800 horsepower Ford F-150’s. Kyle battled with Johnny Greaves for much of the race and made a spectacular mid-air pass of Rick Huseman to move into second place behind Scott Douglas, and held on to earn a position on the podium. Curt moved his way through traffic from tenth place to finish just off the podium in fourth place. Todd LeDuc experienced a damaged radiator in his 800 horsepower Ford truck and battled slick track conditions, but kept his cool and captured a tenth place finish in Sunday’s Round Two Unlimited 2 battle. Rockstar Makita LeDuc Racing is preparing for the next stop on the LOORS circuit, which takes place at Speedworld Off Road Park in Surprise, AZ on April 17-18, 2010.